Learn about beneficial garden bugs. Spider identification can be difficult because of the huge variety of spiders that inhabit our planet. Most spiders are harmless, and many are actually helpful in the garden. The ability to identify the poisonous spiders is what is important to most people. There aren't that many dangerous spiders in the world. Learning about spiders and spider identification allows you to know which spiders to get rid of and which to allow in your garden. Spiders are helpful predators of many garden pests and should be allowed to remain whenever possible. The Hobo spider lives in the Pacific Northwest and is most commonly found in homes. They are medium size, tan to brown in color and have a herringbone pattern on the upper surface of their abdomen. The bite of this spider can produce an oozing wound that should be looked at by a physician. Within two days blisters form and break and the tissue around the bite begins to break down and ulcerate. The Brown Recluse spider lives in dark, isolated places in the home. Bites are more likely to occur when humans are cleaning areas that have been undisturbed for long periods of time. The bite follows a similar pattern as the Hobo spider, resulting in an ulcer that continues to grow and destroy the flesh around it. The Brown Recluse spider color is normally brown. The most outstanding feature is the fact that it has a violin shape brown marking on its face and three pairs of eyes rather than the four pair that spiders normally have. There are other poisonous spiders, however these are the ones most often encountered, or most dangerous. Spider identification of harmful spiders can be difficult since many of these are hidden and the bite may be not be noticed until later on. Most of the other spiders found in and around the home and garden are harmless. They can be fun to observe, and their webs are amazing. If spiders are in an area that you would rather they would not be, they can be discouraged by diligently removing their webs, as well as using other natural methods of spider control. Using pesticides is not the best way to get rid of spiders because of the damage that it can do to your home and garden. 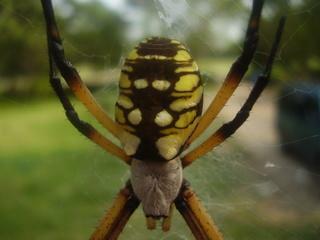 The Orb Spider is easily identified by the zig zag it weaves through the center of its web. These spiders can get quite large and have bright yellow or orange, and black markings. It takes its web down every morning and recreates it every night. Jumping Spiders are the odd spiders that startle you when they suddenly jump from one spot to another on a porch swing on a summer evening. Jumping spiders are stocky and brightly colored. Their bodies and legs are often banded with black and white, or they may have velvety red abdomens. Some have metallic colors on them. These spiders have eight eyes, with one large pair in the front. Wolf spiders are up to two inches in length, hairy, and are a grayish brown in color. The spider has several lines that run vertically along its body. The female carries the egg sac around with her. When the young hatch, they climb up on the mother and ride there until partially gown. The Southern House spider is often mistaken for a brown recluse. It is larger and darker brown than recluse spiders. While the Brown Recluse has only three pairs of eyes, the Southern House spider has four pair and lacks the violin marking of the Recluse. The web is distinctive and can be recognized by webbing, which radiates outward from a central lair, which is built in a hole or cavity. These spiders are common in barns and old buildings. Spiders of North America: An Identification Manual, by D. Ubick, P. Paquin, P.E. Cushing, V. Roth -This comprehensive guidebook is full of excellent images. There are over 1,400 illustrations of the spiders of North America. National Audobon Society Field Guide to Insects and Spiders, by the National Audobon Society -The Audobon Society is well known and respected in its publication of field guides for the naturalist. This guide has photographs and descriptions of 550 insects and 60 kinds of spiders. Spiders and Their Kin, by Herbert and Lorna Levi -This easy to read guide has numerous pictures and information about spiders of all types. Arachnology, or the study of spiders can be an interesting hobby. Spider identification and the recording of local species through photography and sketches is a great way to learn about spiders as well as record their habits and habitats for the future..